Collective Architecture is looking for two enthusiastic and experienced Technical Architects/Technologists to join our thriving teams in Glasgow and Edinburgh respectively. Candidates with over 10 years experience would be preferred. The posts would initially involve supporting and coordinating the delivery of major residential and civic buildings. 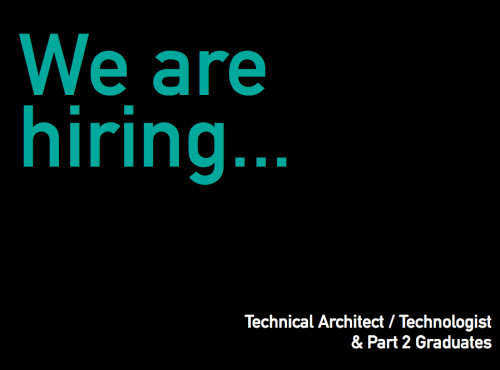 The role would involve working collaboratively with the architectural leads to produce and deliver information. The roles offer the opportunity to support our growing technical team, mentor less experienced architects, coordinate detailed design/production and lead the office in BIM production. An interest in broader office IT issues would also be an advantage. Opportunity to join Collective Architecture Benefit Trust after 12 months of permanent employment. **Please note** Applications should be made through the Glasgow Guarantee portal (link below) we are unable to reply to CVs submitted directly to the practice for this role. Assistants to join our thriving teams in Glasgow and Edinburgh respectively. encourages Part 2 assistants to work towards Part 3 qualification. 12 months of permanent employment.